NFDA | Save the date: NFDA SPRING BALL 2018 is back! Save the date: NFDA SPRING BALL 2018 is back! 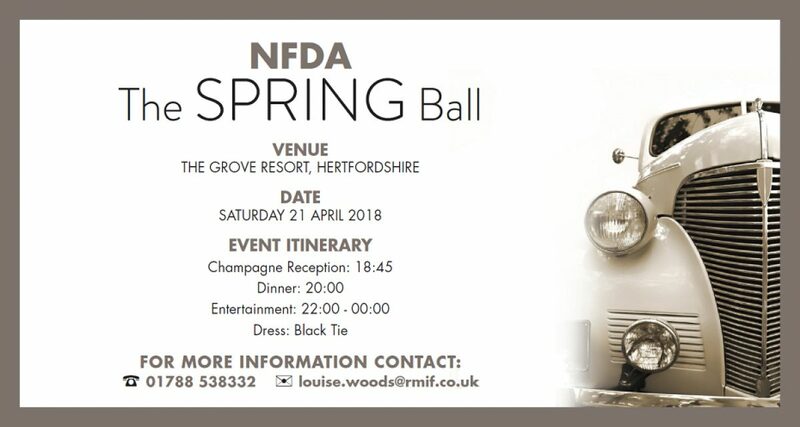 The NFDA Spring Ball will be taking place on Saturday 21 April 2018 at the stunning Grove Resort, Hertfordshire ( https://www.thegrove.co.uk/ ) . The NFDA Ball gives you a unique networking opportunity, an evening of great food, fine wine and top entertainment. Compere for the evening will be television presenter Mark Durden-Smith, live musical entertainment will be provided by motor industry band The Hods. Please contact louisewoods@rmif.co.uk to book your place!